GOLDSBORO – Amon Aldridge, 85, died January 1, 2006, in an Abilene nursing home. Graveside services will be 3:00 p.m. Tuesday, January 3, 2006, in Counts Cemetery in the Content Community with Elder Travis Brown officiating, directed by Fry- Bartlett Funeral Home in Tuscola. Amon was born January 16, 1920, in Content in Runnels County, to Douglas David and Sarah Cathilee McMillon Aldridge. He was a U. S. veteran of WWII. 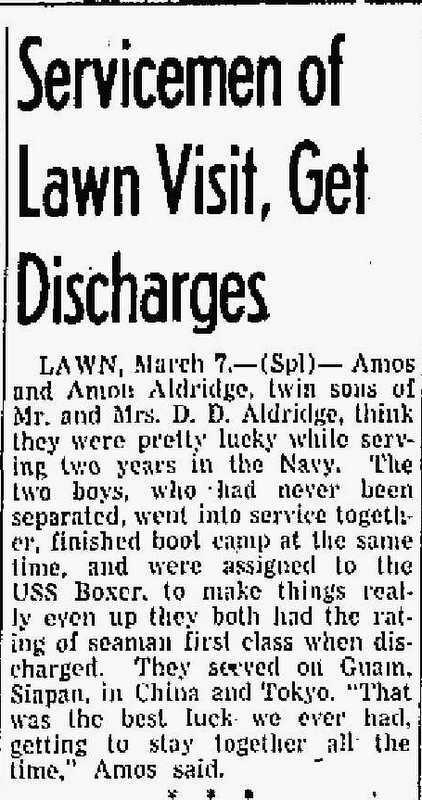 After the war he married Juarie Walden July 6, 1946, in Dallas. He and his twin brother, Amos, farmed and ranched in the Content community for many years. Included in the operation was the original Aldridge farm that has been in the family since 1905. He was a member of the first Jim Ned School Board after consolidation with other South Taylor County school districts. He was a member of Lebanon Primitive Baptist Church in Lawn. Preceding him in death were his parents; his wife, Juarie in 1990; four brothers; and five sisters. Survivors include one son, David Aldridge and wife Karen of Novice; one daughter, Amy Allyn of Goldsboro; one brother, Amos Aldridge and wife Dorothy of Goldsboro; one sister, Marjorie Wright and husband C. T. of Abilene; two grandsons, Eddy Allyn and Chace Aldridge; four granddaughters, Kaylee Cortinez, Lyndee Allyn, Kassidy Hill, and Danielle Aldridge; four great-grandchildren; and many nieces and nephews and other relatives. Memorials may be made to St. Jude Childrens Research Hospital, 501 St. Jude Place, Memphis, TN 38105-1942.